Toby McGonigal is a seventeen year old boy on a routine space mission, heading for a far-off moon of the planet his family has colonized. But something goes wrong. And when he wakes up, 14,000 years have passed. And everything has changed. 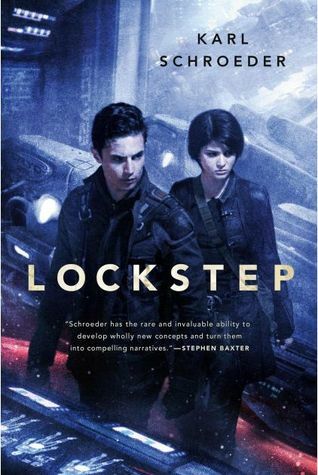 Lockstep is an inventive YA science fiction novel that will appeal to brainy readers who enjoy complicated worldbuilding, and many young men will connect to Toby's fundamental challenges (you know, looking for his mom, taking care of his brother, who by the way has become a dictator ruling over 70,000 worlds, pretty standard stuff). The most remarkable feature about Lockstep is the fresh new solution it brings to one of the oldest problems in science fiction: the impossibility of faster-than-light travel. Rather than invent some fictional technology like a warp drive or a tylium-based propulsion system, this universe operates on the lockstep principle: a complicated system whereby entire worlds go into hibernation for years at a time, with different worlds "wintering over" on its own schedule, to accommodate the decades-long journeys required for travel between star systems. It's impossible to explain in a review, and many readers will still be baffled even after reading the whole book. As a resolute SF fan, I will say that the lockstep principle does feel like a well-thought-out and coherent technology... but at the end of the day, the book feels like the author spent too much energy on the worldbuilding, and not enough on creating realistic characters that we care about. Toby's fundamental character flaw is his lack of curiosity: waking up in a radically different world, and surrounded by people who want something from him, he seems remarkably comfortable to sit back and let stuff happen. It feels like the author is trying to keep the action moving forward without getting too bogged down in big-picture stuff, but it's frustrating for the reader when the main character doesn't ask the 1,001 questions that a real person would ask in that situation. This book will appeal to many readers, perhaps especially to young men who like complex tech and dystopian revolution intrigue, and who don't mind two-dimensional characters that don't always behave like real people would act in their situations.